This interesting and unusual surname, of Anglo-Saxon origin, has two possible sources, both deriving from the Olde English pre 7th Century "heafod" (Middle English "heaved"), head. In the first instance, "Head" originated as a nickname for a medieval chief or village leader; one whose counsel was sought in matters pertaining to law, business and decisions of great consequence. The surname from this source first appears on record in the latter part of the 12th Century (see below). One Thomas Hede was noted in the Calverley Charters of Yorkshire, dated 1246. The second possibility is that the name is topographical, denoting residence at the head of a stream or valley. The Olde English "heaford" was used in various transferred senses, such as "headland, summit, upper end, source of a stream". Early examples of the surname from this source include: Thomas del Heved (Nottinghamshire, 1275); Roger Byheved (Cheshire, 1285) and Walter Othehede (Derbyshire, 1331). 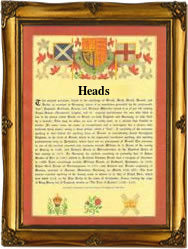 In the modern idiom the name is spelt Head, Heads and Heed. A Coat of Arms granted to the Head family is silver, a chevron ermines between three black unicorns heads couped, the Crest being a unicorn's head couped ermines. The first recorded spelling of the family name is shown to be that of Ralph Heued, which was dated 1166, in the "Pipe Rolls of Norfolk", during the reign of King Henry 11, known as "The Builder of Churches", 1154 - 1189. Surnames became necessary when governments introduced personal taxation. In England this was known as Poll Tax. Throughout the centuries, surnames in every country have continued to "develop" often leading to astonishing variants of the original spelling.